I saw a recipe on Sam Schuerman's blog the other day for Sun Dried Tomato & Sausage pasta and that gave me the idea to make it for lunch today but I did not stick to her recipe. Mine is actually a totally different version all together because I used what I had on hand today but I will make her version in the future. I know it is not even October so I should not even be mentioning Christmas!!! 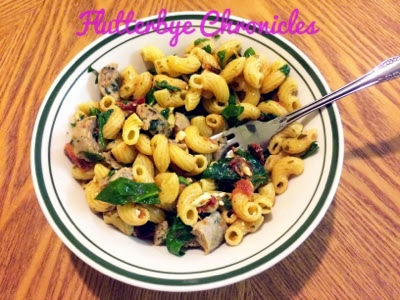 It is really a pretty dish so it would be perfect to take to a pot luck or family get together if you double the recipe. Boil pasta per boxes instructions. I like my pasta a little past al dente so I cooked it for 10 minutes. 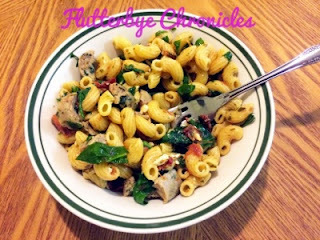 While pasta is boiling place your chicken sausage in a skillet and cook until golden brown then cut into bite size pieces. When the pasta is done drain and return to pot and put in cut up spinach until spinach has wilted. I placed my pot back over the cooling burner to keep the dish warm while I added all the ingredients. Then add pesto, sun dried tomatoes, chicken sausage and feta. 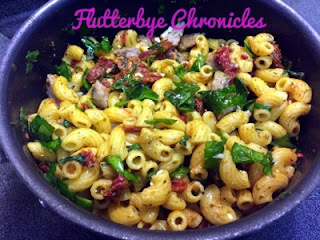 If you want to also try another pasta dish that is tried and true & is super duper easy then check out this one by Sugar N Spice Gals: Sun Dried Tomato Penne Pasta Salad. I am so excited for Fall. I love when the leaves change and it starts getting cooler. Not that it is cooler where I live right now….try 91 degrees today !! Are you noticing that I LOVE me some Pumpkin everything!! I spent all morning running errands so I was very excited to see my little pink package in the mail when I got home. First thing I absolutely love this months bag. It is Silver with Studs. Very motorcycle chic! The first item in my bag was this dual ended eye shadow brush by Crown Brush. One side is a shadow brush and the other is a crease brush. Next up a Pacifica liner in the shade gun metal. but I left it on for quite some time then rubbed it to see if it has staying power and got this….I was left with no liner and a bunch of sparkle! It got good reviews on the website and some of the reviewers said it lasts all day??? My 3rd item was Mitchell & Peach luxury hand cream. This was okay. I was not really thrilled with the scent but it did soak in pretty quick. 4th item was a moisturizing face cleanser by Nourish Organic. I am not sure about this product. It did not have a good scent at all and I don’t like washing my face with anything that stinks soooo! Last but not least was this really pretty tinted lip gloss from Cailyn. It was in the color love affair which is perfect for Fall. I am not sure if I love this color on me though?? but it loved me cause I could not get it off my hand. I have to say this is the first time I have been a little disappointed in my bag. I only liked three of the products one of which was the bag. I am really excited to use the eye shadow brush and I like the gloss color, but that is it. The verdict is still out on the eye liner.